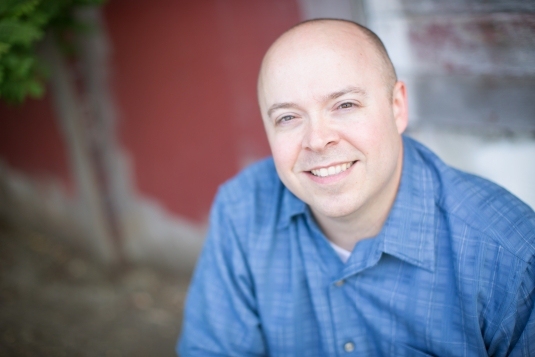 Meet Visianary Mark Yeatman, one of the winners from our 2011 Visian ICL giveaway. I started wearing glasses in the 4th grade when I was having trouble seeing the board. My vision got progressively worse and as such my glasses got thicker and thicker. No matter what people say, wearing glasses as a kid has consequences. Glasses weren’t cool back then so you were automatically labeled a “nerd.” As an adult you realize that these things don’t matter as much, but as a kid it’s not fun. In what ways has bad vision affected your life? Beyond the social effects, having bad vision is a hassle. Messing with glasses or contacts every day gets old real quick. As an adult the primary issue was my bad vision added risk to my outdoor activities (climbing, hiking, hunting, adventure travel) because if I lost my glasses or contacts I’d be stranded and unable to help myself. Conquering this insecurity was the ultimate reason I wanted to fix my eyes. My opthamologist mentioned ICLs during one of my routine exams. He had told me that I’m not a great candidate for LASIK and that the ICL may be a better option for me. Right afterwards I went to the Internet and started researching them. The Visian ICL contest came about while I was saving money for the procedure. I had liked the Visian ICL page on Facebook, saw the contest details and figured “someone has to win” so I went ahead and entered. What was your reaction when you discovered you had won? I was thrilled! So many things came together to make it happen that I really felt blessed. How was the process in preparing for the Visian ICL procedure? It was fairly simple process that was done in an hour or so using machines that examine the eye to make sure I was a good candidate for the ICL. Day of the procedure: How did you feel? I thought I would be nervous but wasn’t. A regional TV station came to interview me about winning the contest so there were a lot of people in the waiting room which took my mind off the actual procedure. 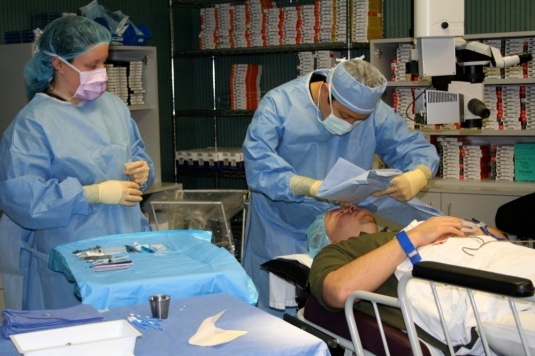 During the procedure: What was the experience like? The procedure itself was relatively painless. 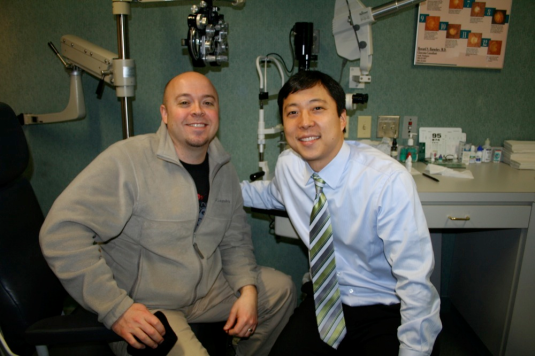 The only uncomfortable thing was looking into the surgical light but Dr. Chung dimmed that as much as possible. He explained the process as he went along which was reassuring and helped me understand what was happening. What was the first thing you saw with your new HD vision? The first thing I saw was the ceiling grid! The simple fact that I could make it out from that distance was amazing! Before the procedure I couldn’t focus on anything more than 6 inches from my eyes. The second thing I saw was my wife entering the room which was really special to me. What was your recovery process like? My recovery process was fairly quick. There was a series of eye drops for the next few weeks as well but they gave me written instructions so that was fairly easy to follow. Simply put, I can see! It’s so nice to be able to just wake up and see without having to fish around for a pair of glasses. Being able to just wake up and see my family is the best thing!